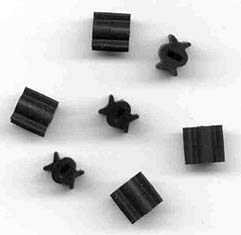 Clavinet.Com reproduction clavinet key bushings. Injection molded by the same facility that makes our clavinet hammer tip set, these bushings (or grommets) fit underneath each individual key and act as "shock absorbers". Years of constant hammering render these bushings useless, as keys begin to "click-clack". Worse yet, these old bushings will sometimes tear or "enlarge", causing keys to "freeze" or return very slowly. See our Keyspring Installation Video on how to easily remove these bushings. Note: We recommend replacing the keysprings at the same time, as both jobs require key removal. Fix them both while you are in there! Sold in complete sets of 60.